At least once a year, set aside a Saturday for garage cleaning with kids. 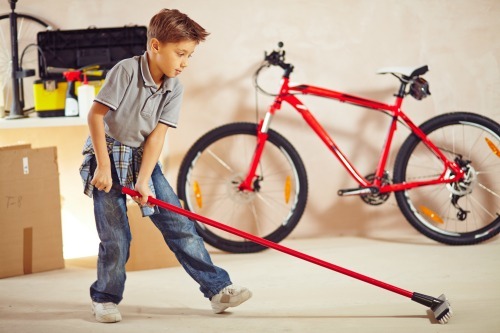 Kids can help clean the garage floor and driveway, at least twice yearly. Actually, you should do it twice a year: when you get out the summer stuff, and again a second time when you get out the winter gear. Garage cleaning day is the ideal time to ooh and ahh over all your old treasures and reevaluate whether to keep them. Try to send the little ones away for this occasion. Ages 8 and up will be of help. Anyone younger will be a hindrance. Be sure to clean the garage once you've lightened the items there. Sweep it out, get rid of oil stains, brush away cobwebs - you get the picture. If you have oil stains on the garage floor, here's how to get rid of them: Scrape up any surface accumulation and dispose of safely. You can absorb oil with a noncombustible material such as automatic dishwasher detergent or cat litter. Grind it into the oil a bit. Leave it on for several minutes, and then pour boiling water on the stained areas. Scrub the floor with a stiff-bristled brush or push broom , and then rinse it with water. Sprinkle baking soda over the cleaned area to neutralize the solution that you've used. Never clean with gasoline. And get that leaky car fixed! Treat other garage floor stains with Spray 'N Wash Laundry Stain Remover and then scrub the stains away with automatic dishwasher detergent. If you see any evidence of rodent droppings, send the kids away, and put on a protective dust and filter mask. Wet the area first. Then wipe the droppings up. You do not want to accidentally inhale any of the rodent droppings because they often harbor viruses and/or bacteria. It's a good idea to wet all dusty areas before sweeping or wiping. This keeps the dust from swirling around and giving you an allergy or asthma attack. Or use a non-petroleum sweeping compound. This mixture of oil, sand, and sawdust catches and holds dirt instead of throwing it up in the air when you sweep. Once the garage floor is clean, apply a cement sealer to seal the concrete floor and protect it from spills. Cement sealers are a great primer if you want to really get fancy and paint the floor. To limit the amount of dust and dirt that your family tracks into the house, place a small indoor/outdoor carpet or large doormat in front of the entry door.